This website provides free teaching and learning materials for students and teachers of students who are in their last years of gymnasium and their first years of technical high school. Teachers can also find video tutorials and an overview of the companies involved in JOBS. 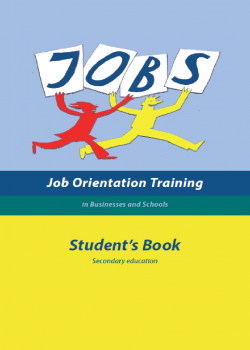 The project “Job Orientation Training for Businesses and Schools” (JOBS) supports students with contemporary teaching methods. The aim is to help students develop a realistic view of the job opportunities available to them and equip them with the competences they need to make an informed choice for their future. Students are the main agents in JOBS lessons. They are assigned tasks, which they complete either on their own or in teams. While solving the tasks, they learn to identify their strengths and their areas of personal development. Some tasks focus on research about the professional world, some are about presenting themselves professionally, others involve t spending a day in a local business. JOBS prepares students who are in the last year of gymnasium or in the first year of technical college for the upcoming choice for a profession. The Teacher Brochure includes useful information about organizing, delivering and reflecting on a JOBS teaching sequence.